The spring equinox arrives Wednesday evening. Here’s everything you need to know. If you’re ready for warmer weather, blossoming trees and allergies, you won’t have to wait much longer. March 20 is the vernal equinox, which traditionally marks the first day of spring in the Northern Hemisphere. This year’s equinox — which occurs Wednesday at 5:58 p.m. Eastern time — will also feature the third and final supermoon of 2019. Less than four hours after the equinox, the moon will appear full at 9:43 p.m. According to EarthSky, the spring equinox and full moon haven’t occurred this closely together since 2000. While a full moon on the first day of spring is relatively rare, the vernal equinox happens every year on or around March 20. The equinox is the exact moment when the sun’s strongest and most direct rays shine on Earth’s equator before crossing into the Northern Hemisphere. Wednesday is one of only two days of the year — the other being the autumnal equinox in September — when the Earth’s axis is tilted neither away from nor toward the sun. As a result, the Northern and Southern Hemisphere see approximately 12 hours of daylight and 12 hours of darkness. Most places on Earth, apart from the polar regions, also see the sun rise at due east and set at due west along the horizon. The arrival of spring means the sun is climbing higher in the sky with each passing day. The sun is now up for more than 12 hours, and we’ll continue to see daylight increase for the next three months until we reach the summer solstice, the longest day of the year, June 21. Though “equinox” comes from the Latin words “aequus” (equal) and “nox” (night), both of Earth’s hemispheres actually see slightly more than 12 hours of daylight on the equinox. In Washington, sunrise on Wednesday will be at 7:12 a.m. and sunset will be at 7:20 p.m., bringing us a total of 12 hours and eight minutes of daylight. 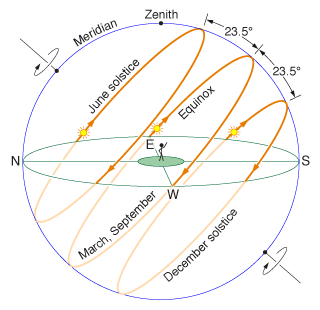 The date of the “equilux” — when sunrise and sunset occur exactly 12 hours apart — was March 17. Why aren’t day and night exactly equal, as the name implies? There are two reasons for this. One is atmospheric refraction, the bending of the sun’s light as it passes through Earth’s atmosphere. This causes the sun to appear slightly higher in the sky than it actually is. The other is how we measure the length of a day. The sun appears as a disk in the sky, not a single point. Sunrise occurs as soon as the sun’s upper edge appears on the horizon, while sunset doesn’t occur until the sun’s upper edge disappears from the horizon. Every year around the March equinox, we see daylight increase faster than at any other time of year. Washington is now gaining about 2 minutes and 32 seconds of daylight each day. By the end of March, sunrise and sunset are more than 12½ hours apart. Locations to our north are seeing even greater increases in daylight. In Boston, daylight is increasing by nearly three minutes each day. Seattle is tacking on 3 minutes and 27 seconds, and in Fairbanks, Alaska, the sun is up 6 minutes and 43 seconds longer with each passing day. At lower latitudes closer to the equator, the increase is slower. Miami and Houston, for example, see their daylight hours increase by less than two minutes a day. As the days grow longer and the sun climbs higher in the sky, temperatures start to rise as well. The District’s average high temperature, now 57 degrees, hits 60 on March 27 and climbs to 71 degrees by the end of April. And although temperatures below freezing are not uncommon into the first half of April, the average date of the last freeze is quickly approaching inside the Beltway. So, while it’s probably too early to hang up your winter coat for the season, the arrival of the spring equinox means that cold days are usually numbered. Now that the sun brightens our skies for more than 12 hours each day, it can only mean that warm spring weather is just around the corner.